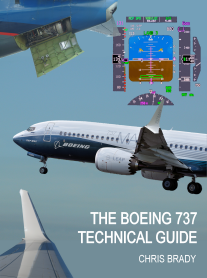 The 737 Airborne Early Warning and Control is designed for countries that don't need (or can't afford) the capability of the much bigger 767 or 707 AWACS. The base plane is essentially a Boeing Business Jet, which has the 737-700 fuselage with the stronger 737-800 wing to support its extra weight and the BBJ aux fuel tanks. 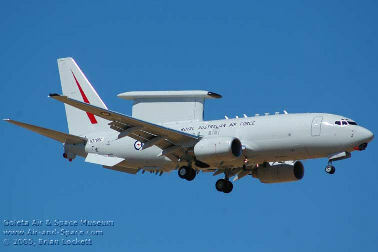 The 737 AEW&C costs between $150 million & $190 million, this compares with about $400 million for the 767 AWACS. It carries a mission crew of between 6 and 10 in the forward cabin. Its main external feature is the “Top Hat” antenna. This is a phased-array, Multi-role Electronically Scanned Array (MESA) radar sensor developed by Northrop Grumman and mounted in a rectangular fairing over the rear fuselage. The antenna alone weighs 2950kg (6500lbs) and is 10.7m long. It provides fore and aft coverage with a low drag profile allowing the system to be installed without a significant impact on aircraft performance. The pylon air intakes are for the liquid cooling system. Inevitably, the Top Hat reduces the airflow over the fin & rudder which has necessitated the addition of two ventral fins to increase the directional stability for engine-out flight. Also the elevator feel pitot probes have had to be moved higher up the fin away from the disturbed airflow (see photo). Other modifications include a new section 41 with a cut-out for an air-to-air refuelling receptacle and nose, wingtip and tail mounted counter measure systems. The aircraft will also have chaff and flare dispensers and approx 60 antenna and sensor apertures. The IDGs are uprated to 180kVA and can be seen bulging from the engine cowls. DOW is expected to be just over 50,000kg (110,000lbs). Each AEW&C contains an extra 863 electronic boxes, 300 kilometres of wiring and four million lines of software code more than a standard 737 NG. The first green aircraft arrived at Wichita in December 2002 for structural modifications. Flight testing of the airframe ran from May 2004 until Jul 2005 with the aircraft logging more than 500 flight hours in 245 flights. According to Boeing “The plane performed superbly in terms of its avionics, structure, systems, flight handling characteristics and performance”. This was followed by flight testing of the mission system, including the MESA radar. All appeared to be going well for the project until 2006 when the first of the delays was announced because of “development and integration issues with certain hardware and software components”. Deliveries began to Australia in late 2009 and reached full operational capability in November 2012. The aircraft is known as the “Wedgetail” by the RAAF after the Australian Wedgetail Eagle, which according to the Aussies, “Has extremely acute vision, ranges widely in search of prey, protects its territory without compromise and stays aloft for long periods of time.” The Turkish AF call theirs the “Peace Eagle”, presumably for similar reasons. 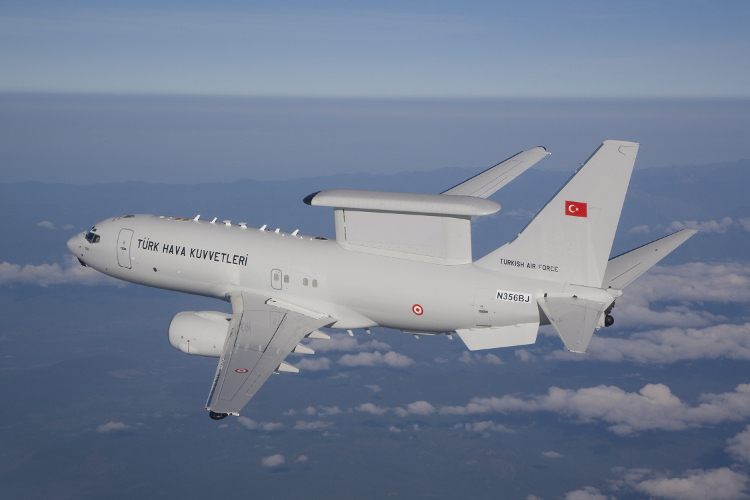 In April 2019 the UK became the fourth country to order the E-7, placing an order for 5 aircraft. The conversions will be modified by Marshall Aerospace & Defence Group. The MoD says that each E-7 will be flown with a crew of two pilots and 10 mission operators and has an operating range of up to 3,500nm (6,470km). The type also will feature commonality with the RAF's future fleet of nine 737NG-based P-8A Poseidon maritime patrol aircraft, the first of which is scheduled for delivery later this year.